The Republic of Georgia is located in the Causcusus, between Russia, Turkey, Armenia and Azerbaijan. It has a western coastline on the Black Sea and benefits from a Mediterranean style mild climate. 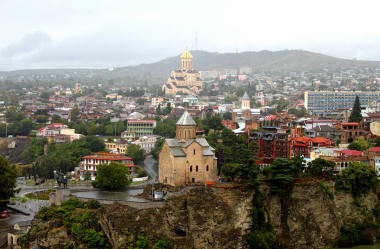 The capital city Tbilisi is named after warm sulphur springs. The tree lined streets have a European feel, long attracting visitors from Marco Polo to Alexandre Dumas. Georgia is the world's oldest wine producing country. Wine, named after the local word 'gvino', has been made here for 8000 years. Unesco have recognised the unique way of making wine in clay jars called 'kveri’. The ancient cave city of Vardizia contains thirteen levels of cave carved into the stone. At 2,300 metres, Ushguli village is the highest settlement in Europe. Legend states that Jason and the Argonuts visited Ancient Georgia in search of the Golden Fleece. Eastern Georgia was called Iberia and it is thought that settlers may have travelled to Spain. The most famous former ruler is known as David the Builder. He liberated Georgia in the 11th century, constructed cathedrals and encouraged poets to leave a lasting legacy. Georgia was an early Christian state, with a rich heritage of monastic building. At the beginning of the 19th century, Georgia was annexed by the Russian Empire. It briefly became independent after the Russian Revolution in 1917, but was occupied by Soviet Russia in 1921, becoming the Georgian Soviet Socialist Republic and part of the Soviet Union. When the Soviet Union was dissolved in 1991, post-communist Georgia endured civil unrest and economic crisis for most of the decade, but has been more stable under democratic government in the 21st Century. This former Soviet Republic was the birthplace of Stalin. Famous for hospitality, Georgia attracts tourists to its combination of high mountain ski resorts and beaches such as Batumi. Georgia has its own unique alphabet, one of around 14 in the world, and a distinctive language.